Why aren’t we seeing more National Living Wage workers? LPC economist Anthony Lord uses analysis from our 2018 report to answer the question: “Why aren’t we seeing more National Living Wage workers?” The report was published on 27 November and is available here. However, in the years since then, coverage has remained at around 1.6m jobs, despite forecasts of large increases. Both the LPC and other organisations had expected coverage to increase to around 3m jobs by 2020. Previous increases in the National Minimum Wage (as it was pre-2016) had generally led to increases in coverage, so it is surprising that the larger recent increases have not had this effect. To put it simply, workers earning slightly above the NLW must have received wage increases of at least the level of the increase in the NLW. Our analysis shows that there are significant ‘spillovers’ from the NLW (as seen in the chart below). Firms increase pay to keep ahead of the NLW, either to attract workers through a premium over the wage floor, or to maintain differentials within their workforce structure. 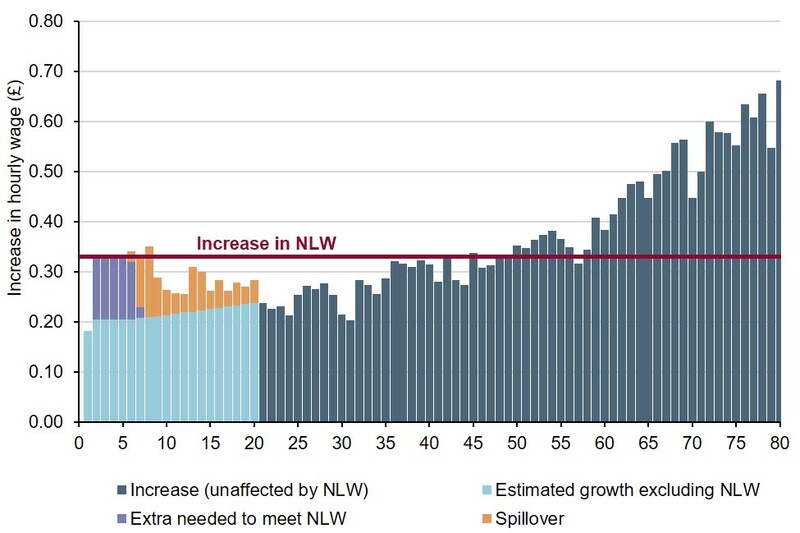 The size of the spillovers and the proportion of the pay distribution affected has varied in the last three years, but workers paid just above the NLW have consistently had pay rises that match or exceed the increase in the NLW. Employers we met this year told us that they had kept their lowest rates just above the NLW to help attract staff. 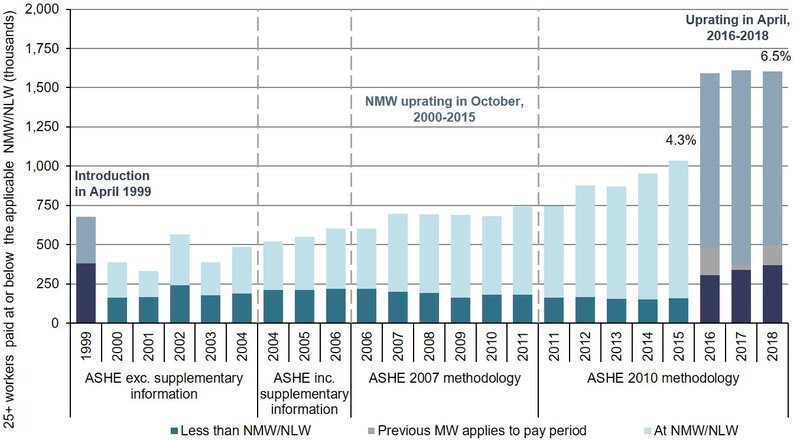 However, the increases in the NLW have not been matched all the way up the pay distribution, indicating that pay differentials have been squeezed. This means that more workers are being paid at a rate that is close to (but above) the NLW. A convenience store chain we visited in Scotland told us that differentials for supervisors had been cut from 50p to 40p above the NLW. So where are these workers? While those just above the NLW have had pay rises equivalent to the increase in the NLW, jobs slightly further up the pay distribution have had smaller pay rises. This means that there is an increasing number of workers who are earning slightly more than the NLW. This can be seen in the chart below. However, while coverage has been flat since 2016, the number of workers earning between 5p and 50p above the NLW has jumped to 1.6m (from 1.3m in 2016), driven primarily by the increase in those earning between 10p and 20p more than the NLW, which has more than doubled since 2016, reaching 630,000 in 2018 – around 2.6% of all workers. The short answer is that we’re not sure. 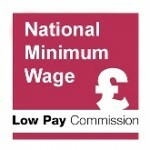 It could be that by 2016 the NLW had already captured all the jobs that could easily be moved onto the minimum wage without affecting differentials; since then, employers have had to retain some differentials for those roles paid above the minimum wage, and further increases could require them to rearrange their workforces. Another reason could be that the tightening labour market means that employers feel that they need to continue to pay above the NLW. Finally, it could be that, because we are providing a path to 2020, employers have decided to pay ahead of the NLW for the moment knowing that the wage floor will eventually catch up, and that when we reach the 2020 target we could see coverage rise again. Since 2016, the number of jobs paid the NLW has remained steady (despite annual increases in the rate); but the number of jobs paid in a range just above the NLW has grown significantly, as the NLW has pushed up their pay. 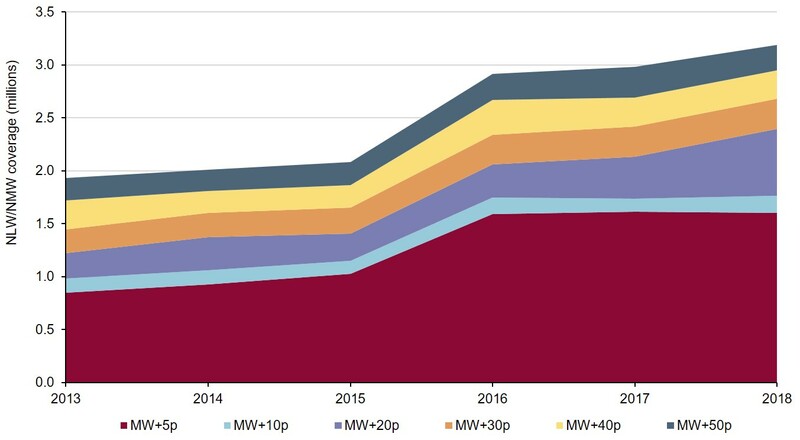 It remains to be seen how much longer employers can continue to pay those jobs at a rate above the NLW, as the minimum wage increases along a path to 60% of median earnings in 2020.